Supporting People: Clark Bailie (left), Chief Executive of the Housing Executive is joined by Siobhan McCauley, Housing Executive Director of Regional Services; Louise Warde Hunter Deputy Secretary, Department for Communities; Professor Peter Roberts, Housing Executive Interim Chair; Anne Sweeney, Housing Executive Assistant Director Strategic Partnerships; and Ricky Rowledge (right), Joint Chair of the Committee Representing Independent Supporting People Providers (CRISSP). 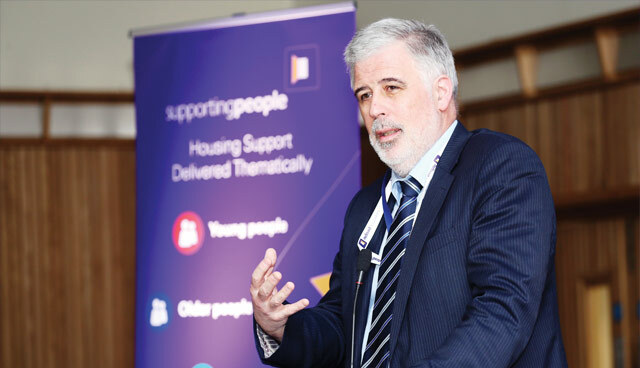 Supporting People has been delivered by the Housing Executive, on behalf of the Department for Communities, since 2003 and during that time has made a significant difference to the lives of thousands of vulnerable people throughout Northern Ireland. Approximately £1 billion has been distributed over the years by the Supporting People Programme to help deliver housing related support services. Housing support services are designed to enable vulnerable people to live as independently as possible in the community. Short term support can be delivered in people’s own homes or via accommodation services such as homeless hostels or domestic violence refuges. Longer term support can also be given to enable people with disabilities or older people to sustain a home. Other services support young people leaving care or people leaving prison. Housing support services vary according to the needs of the service users but can include: developing domestic or life skills, managing finances and benefit claims, setting up and maintaining a home/tenancy, gaining access to other services and finding other accommodation. Helping the vulnerable: Housing Executive CEO Clark Bailie addresses Supporting People Providers at a special conference in Belfast. The Department for Communities gave a Ministerial Commitment in 2015-2016 to protect the Supporting People budget at the level of £72.8 million. To date the Supporting People budget continues to be protected by the Department for Communities. Whilst the Supporting People budget has not been increased the protection has ensured that there has been no decrease unlike many other departments. In the wider UK context, the ring fence on funding for the Supporting People programme was lifted in England and Scotland in April 2009, with its allocation subsumed into the Formula Grant paid to local authorities. This meant that the allocation was no longer separately identified. The ring fence continues to remain in place in Wales. The Housing Executive works with a wide range of service delivery partners from across the voluntary, public and private sectors. This year alone, over 850 services were delivered through 87 organisations providing over 19,000 people with housing support. One of the key features of Supporting People in Northern Ireland is the need for a cross agency approach. In addition to being responsible for delivering the Supporting People Programme, the Housing Executive also leads on strategic planning, working in partnership with our statutory partners in Health and Justice, particularly the Northern Ireland Health and Social Care Board and the Probation Board for Northern Ireland. This year, as we develop a new three year strategy for Supporting People (2020-2023), we have the opportunity in association with our partners in the Department for Communities to create a clear and shared vision for the future of housing support within the arena of social care. 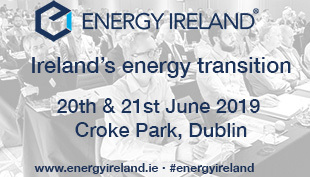 Building on the work undertaken in developing the interim plan for 2019-2020, we recognise the importance of continuing to work in partnership with our delivery partners and our continued commitment to engage with all of our delivery partners during the development of the three year strategy. Engagement will be carried out through a variety of different methods which will include events, face to face meetings, online surveys and workshops to ensure vital feedback and views from our delivery partners are captured. 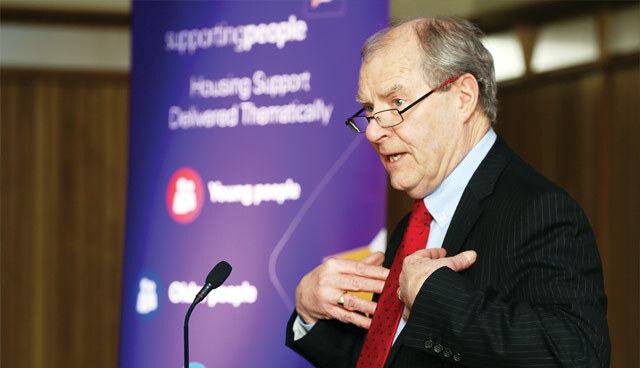 Strategic planning: Housing Executive Interim Chairman, Professor Peter Roberts, outlines the organisation’s approach to the Supporting People Programme, which assists some of the most vulnerable people in Northern Ireland. The Housing Executive’s vision is for Supporting People to deliver high quality housing support to those in greatest need and to complement, but not duplicate other social care provision, offering value for the public purse and services that are flexible enough to respond to changing priorities while remaining clear in our central purpose of providing housing support. Although it presents some unique challenges for policy makers in the Northern Ireland context, where various elements of social care provision are overseen by Department for Communities our aim is to develop a shared strategic vision, shared by all partners, with agreed priorities and correspondingly aligned budgets. In the context of ever growing need and increasingly constrained resources, it is vital that those resources are aligned to mutually agreed priority needs in order to deliver maximum social impact and demonstrable value for public money. To celebrate 15 years of the Supporting People Programme a short film was commissioned, which provides an insight into the services delivered by our partners; the film can be viewed on the Housing Executive YouTube Channel, found by searching ‘Housing Executive Supporting People’. In the words of one of the young service users featured in our film: “Without the support, you are doing it for yourself… coming here was a really big help for me and a really big step to where I want to be”. With help and support, this young person is being provided with the guidance and the skills required to move on to more independent living in the community. Other success stories in the film can be seen through the maintenance of peoples’ independence. A client living with a disability has remained independent in a safe, secure environment with support from staff and assistive technology. We congratulate our delivery partners for their hard work and dedication and look forward to continuing to work in partnership with you all in the future.